2. Precise Cutouts, the perfectly aligned cutouts of the ports, camera and speakers give full access. 3. 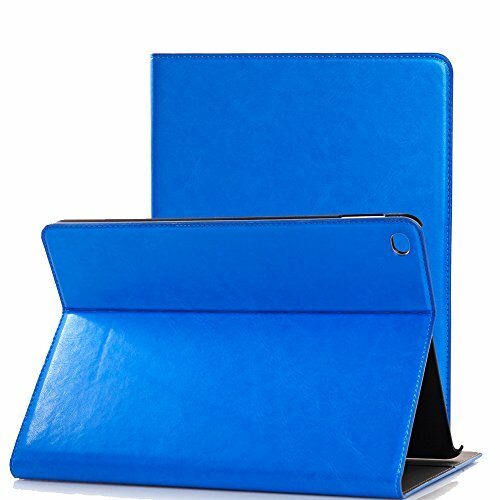 Lightweight, Slim and Simple Design, great protection without bulkiness, the solid Color synthetic leather is concisely elegant and everlastingly stylish. 4. Soft microfiber interior lining that protect your screen and keeps your display clean. 5. Protect your iPad from scratches and bumps,easy and snap-on installation. 6. The reading or viewing at various angles ideal for watching videos, typing or messaging.The display is completely unobstructed. 7.Its seamless design helps the case look sleek, stylish and durable. 8. Card slots and money pocket. 9. Stand function release your hands. iPad Pro 12.9 2015 release Model No. A1584,A1652.